In the bad old Communist days, a visit to a showpiece factory was de rigeur part of any Western journalist’s visit to Eastern Europe, so I was amused that the highlight of the first day of the AEJ’s Congress in Bucharest today was a trip to the Dacia car production plant, about two hours’ drive out of the capital. This entailed a 6.30am start but of course the visit was not quite what it would have been in the old days. The French firm Renault took over Dacia in 1999 and has since totally streamlined its output. Last year, almost 350,000 vehicules were produced at the industrial site I visited, 90% of which last year went for export, the cheapest, perfectly acceptable four-door little car selling for around 4,000 euros, or ten times the average monthly wage in this country. 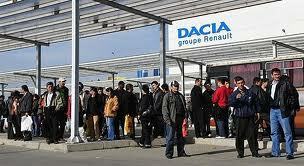 Dacia pays its own workers about twice that norm and interestingly around 30% of its workers are female. Visitors are driven round the huge complex in a little toy train of the sort that ferries holiday-makers round British seaside resorts, but this jaunt was followed by a slap-up buffet lunch on-site (no alcohol, of course). Dacia is Romania’s main export earner and is determined to maintain that distinction. It’s true, I saw an awful lot of them when I was in Algiers two weeks ago! This entry was posted on Friday, 11th November, 2011 at 10:18 pm	and is filed under Uncategorized. Tagged: AEJ, Bucharest, Dacia, Renault, Romania. You can follow any responses to this entry through the RSS 2.0 feed. You can leave a response, or trackback from your own site.